Welcome to the Meet the Troll Family page. I created the Troll Family in 1993. They are one of the oldest sets of characters on the Storyland website. They consist of Troll Daddy, Troll Mother, Troll Sister, Troll Brother and Troll Baby. The Troll Family came to life for me because my two children loved to play with those little troll dolls with the brightly coloured hair. They had quite a few of them and they would play for hours and hours with them. The Troll Family in my stories, live in Troll Town, which is located in central British Columbia, Canada. 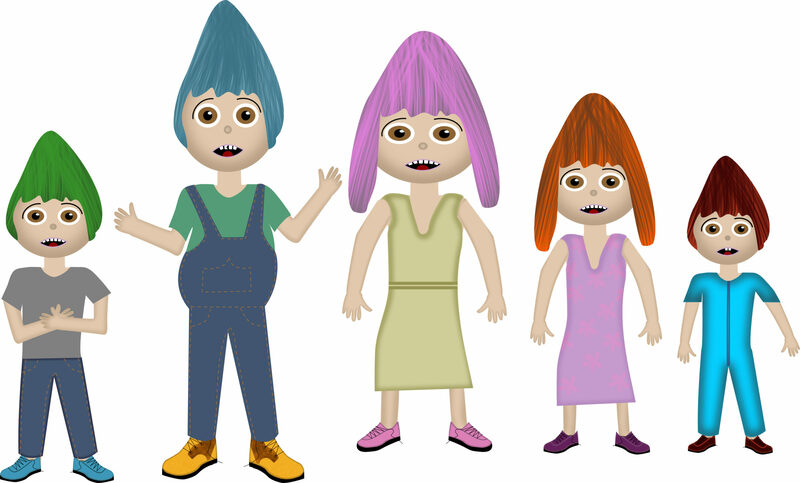 The Troll Family are far from rich but they are a very happy, loving and hard-working family with simple needs. It is always fun writing stories about the Troll Family. I hope you enjoy reading the stories I have written about them. This entry was posted in Meet the Characters, Troll Family Stories and tagged meet the Troll Family, Troll Family. Bookmark the permalink.